Visit Japan and you’ll see symphonies of artistic sweets. The eye follows an unbroken rhythm of desserts composed into perfect rows. Each piece influenced by the natural beauty of the season. In springtime, both traditional Japanese sweets shops and Parisian-inspired patisseries celebrate cherry blossoms. To revel in the warm March winds blowing spring our way, I decided to make Gluten-Free Chocolate Cherry Pie Minis. I’ve baked cherry blossom cookies and cherry chip blossom cupcakes. But I’ve never made a cherry pie. Plus it’s one of my gluten-sensitive husband’s favorite pies. So, I created a Gluten-Free Chocolate Cherry Pie. Motivation to make the pies minis came from translating for fashionistas from Japan the other day. As I assisted the talented young ladies navigate an American restaurant menu, I was reminded how petite and pretty are priorities when plating food. Blissful bites of cherry mingle with chocolate chip cookies. The cherry pie filling was made with a blend of (zero-calorie) Stevia and organic sugar. I was curious and crossing my fingers about the chemistry of the sometimes bitter Stevia / organic sugar blend with the cherries. The worry was wasted. The cherry pie filling is a luscious duo of cherries accented with a touch of sweet. 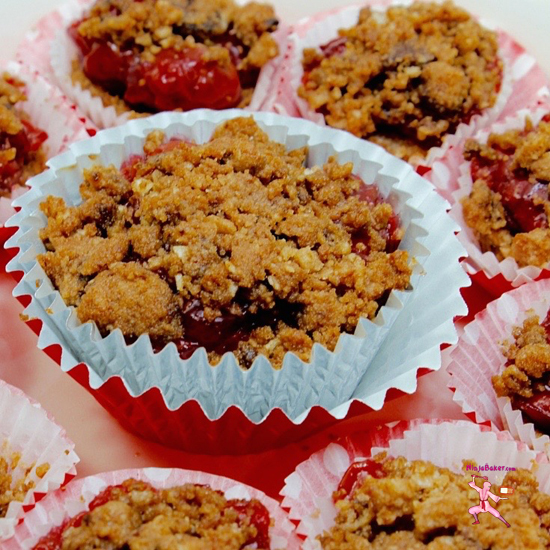 Sweeten any bento box with Gluten-Free Chocolate Cherry Mini Pies. The gluten-free crust and crumble, while delicious, could’ve been more scrumptious. A slightly more expensive box of gluten-free chocolate cookies might have remedied the situation. You know how the experts always say to use quality products? It’s true. I simply should’ve sprung a few extra dollars and picked up a box of gluten-free chocolate cookies I know are sublime. At any rate, the mini pies are perfect for pass-around treats at parties; small pick-me-up snacks and a solution to satisfy a hankering for bites of cherry pie bliss. Doll-size gluten-free chocolate cherry pies. Classic American cherry pie takes a tasty gluten-free twist...with a touch of chocolate! Adapted from The Artful Parent. In a sturdy saucepan, mix the cherries plus the liquid from one can with sugar, cornstarch, salt, vanilla bean paste and powdered lemon zest. Keep stirring the filling over a medium-low flame and allow a slow bubbly boil. (About 10 minutes.) The filling will thicken and look slightly jellied. Take the saucepan off the stove. Let the mixture cool. Melt the butter (1 minute in the microwave.) Pour the gluten-free chocolate chip cookie mix, the gluten-free chocolate cookies and the butter into a food processor. Pulse until well combined. Press the mixture into cupcake cases. (½ tablespoon for minis, 1 tablespoon for regular sized cupcake cases.) The extra cookie mixture will serve as crumble for the gluten-free chocolate cherry pie minis. Scoop the cherry filling into the cupcake cases. (½ tablespoon for minis, 2 tablespoons for regular sized cupcake cases.) Sprinkle the mini pies with the leftover cookie mixture. Bake in a 425° oven. 5-6 minutes for the mini gluten-free chocolate cherry pies. 7-8 minutes for the regular-sized cupcake cases. Thanks to our Sunday Supper hosts, Stacy of Food Lust People Love and Erica of The Crumbly Cupcake. Wishing you warm, springtime winds of sweetness.